Photo: North slope of Wild Horse Mesa. Eastern Mojave Vegetation North slope of Wild Horse Mesa. 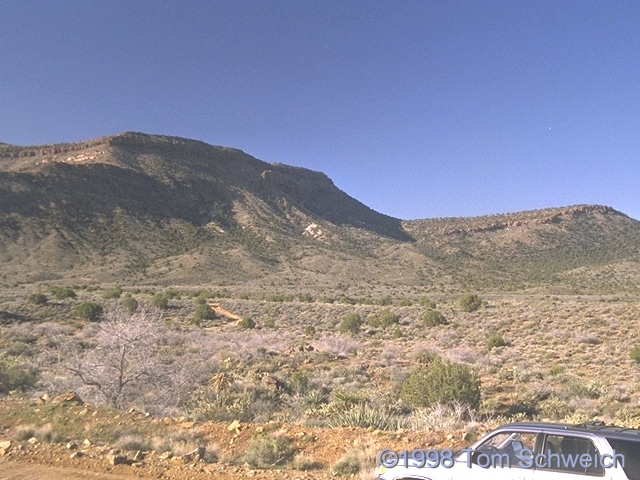 The north slope of Wild Horse Mesa is just west of Wild Horse Canyon Road. This is the one of the locations of my study plots for Frasera albomarginata. Be sure to respect wilderness boundaries, as this road is a "cherry stem" into a wilderness area. Better yet, park your car on Wild Horse Canyon Road and walk. Wild Horse Canyon Road - Mojave National Preserve: North Slope of Wild Horse Mesa. Autecology of Desert Elkweed Frasera albomarginata S. Watson (Syn: Swertia a.) Gentianaceae in the American Southwest: on north face of Wild Horse Mesa. at Wild Horse Mesa.